July's Allure beauty box has arrived and I'm excited to try some new skincare and makeup. I have included some promo codes below. OUAI Leave In Conditioner - A leave in hair mist that reduces frizz and flyaways. I already use this product to detangle my hair after the shower. I wouldn't say it help with frizz but it does keep my hair silky soft and protects my hair from any heat damage. Doucce Precision Eyeliner in Blue - Waterproof, and long lasting in the waterline. Use as a base for eyeshadow or a pop of color. Sunday Riley Luna Sleeping Night Oil - An overnight oil that is suppose to improve fine lines, wrinkles, dryness, texture, age spots, and dullness. This oil is expensive so I'm very excited to use this. Derma-E Essential Sun Protection Mineral Powder- A translucent setting powder to set makeup and protect you from the sun. You have to reapply every two hours so you have to under sunscreen underneath. The Organic Pharmacy Lip Balm- Keeps lips soft and smooth. This has shea butter, rose hip, pomegranate, and vitamin E.
Make Up For Ever Artist Everywhere Pencil - A multi-use pencil used for lips, eyes, brows, contour, and blush. I got the color Full Red, so I'll probably just use this as a lipliner, a base for eyeshadow, and blush. Feel Harmony Rose Petal Facial Mask - A gel mask that helps with hydration, tone, and plump up collagen. This is a vegan friendly. Olay Whips - BONUS ITEM Lightweight daily moisturizer thats leaves skin looking smooth, matte and shine-free. An anti-aging formula to reduce fine lines and wrinkles. 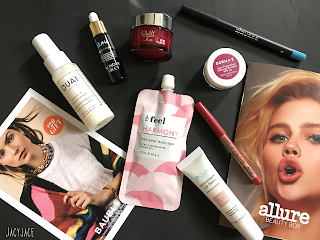 - Thisisfeel.com enter Allure25 to receive 25% off. Valid July 1 through August 29, 2018. - Doucce.com enter EYE30 to receive 30% off. Valid July 1 through December 31, 2018. - Dermae.com enter ALLURE20 to receive 20% off. Valid July 1 through December 31, 2018. - Theouai.com enter allure15 to receive 15% off. Valid July 1 through August 29, 2018. - Makeupforever.com enter ALLUREACP for free shipping. Valid July 1 through August 29, 2018. - Theorganicpharmacy.com enter ALLURE18 to receive 20% off. Valid July 1 through August 31, 2018.